View Sandhill Crane hunting regulations for your county. Gray, with dark wingtips; may appear white in some light. Neck long, extended straight forward in flight. Legs extend beyond tail in flight. Flocks of 2 to hundreds. Whooping Cranes are endangered. Do not confuse them for Sandhill cranes. Be sure before you shoot. Whooping Cranes stand nearly 5 feet tall. They will be the tallest bird you see. Juvenile birds will have rusty feathers with the white. Wingtips (primary feathers) are black, black does not extend all the way along the wing edge to the body. Fly with long necks and long legs fully extended. Wingbeats are slow and steady. Flocks of 2 to 7. Sometimes migrate with sandhill cranes. See more species that are illegal to hunt. Sandhill Cranes MAY be taken with lead shot. However, Wildlife Management Areas and Federal Wildlife Refuges have special regulations requiring nontoxic shot for ALL game bird hunting, including Sandhill Cranes. 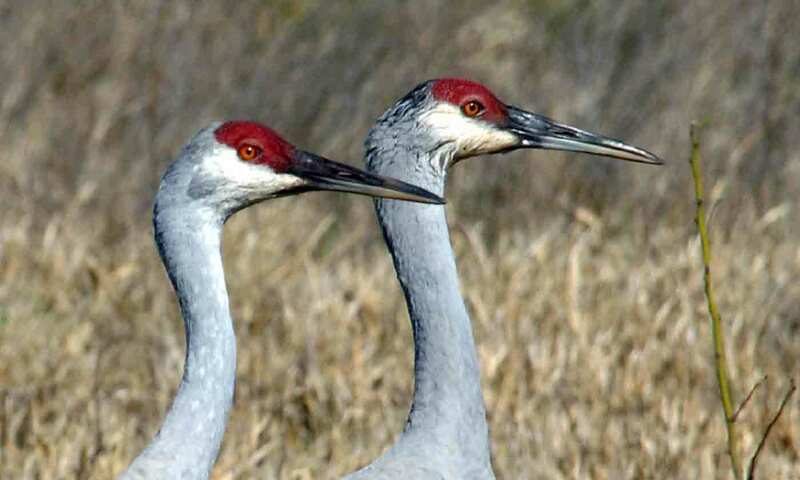 A Federal Sandhill Crane Hunting Permit is required to hunt Sandhill Cranes, in addition to a valid Texas hunting license, Texas Migratory Game Bird Endorsement, and HIP Certification. The Federal Sandhill Crane Hunting Permit can be obtained in person ONLY at TPWD Law Enforcement offices (see pg. 18 of the Outdoor Annual) and TPWD headquarters in Austin, but also is available by phone at (800) 792-1112 (Option 7, menu 7) or (512) 389-4820, 8 a.m. to 5 p.m., Monday through Friday or through Online Sales. For phone and online orders, a transaction receipt will be issued in lieu of a permit. A $5 administrative fee will be charged for online orders. Permittees should keep a record of hunting activities because 26% of crane hunters are chosen for a federal harvest survey.